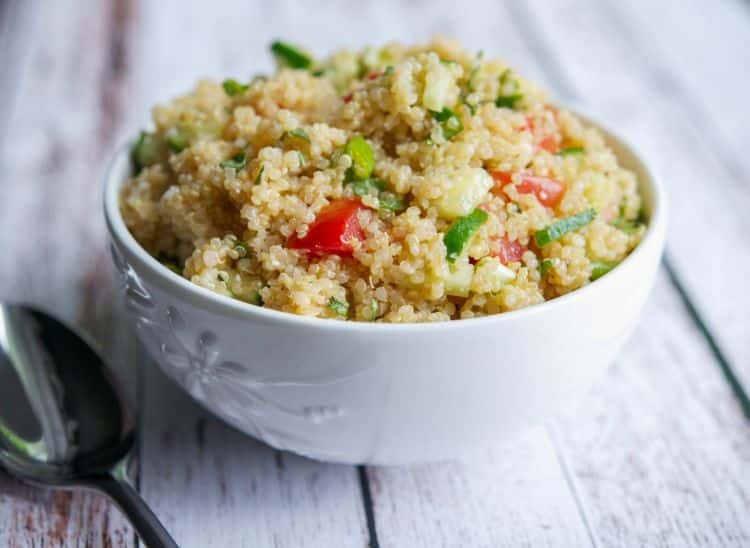 This quinoa salad using fresh garden tomatoes and cucumbers in a white balsamic vinaigrette makes a light and refreshing accompaniment to any meal. I’m officially back from vacation and ready to get our healthy eating back on track. You know how it is when you’re on vacation and splurge on all of the “non-healthy” type of foods you try to stay away from on a regular basis. At least it’s that way with my family. To start, I made a little twist on one of my daughters’ favorite salads and came up with this Tomato & Cucumber Quinoa Salad. I’ve mentioned before that my family wasn’t 100% on the quinoa bandwagon until I started making it cold in salads versus serving it hot as a side dish. 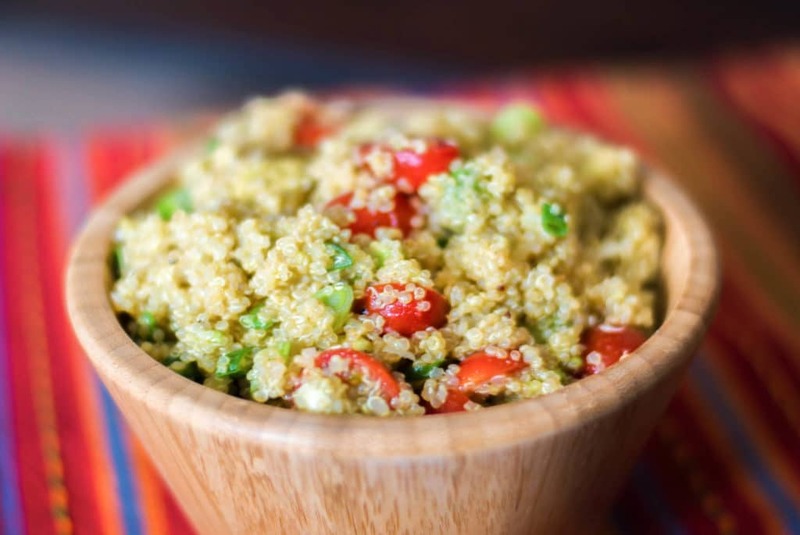 Quinoa has a little bit of a crunch and it’s fluffy, nutty flavor pairs nicely with garden vegetables. 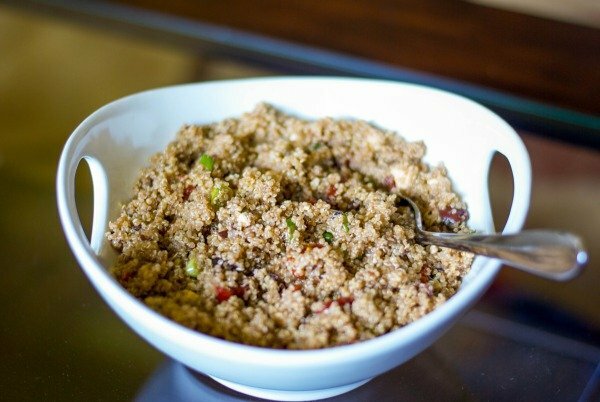 For this recipe I cooked the quinoa ahead of time and allowed it to cool for at least 2 hours. I find that when making a quinoa salad you have to make sure that your quinoa is completely cooled before adding any condiments to it or your salad will become too mushy. 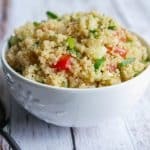 You can even prepare your quinoa the day before and refrigerate until you’re ready to mix in the remaining ingredients. 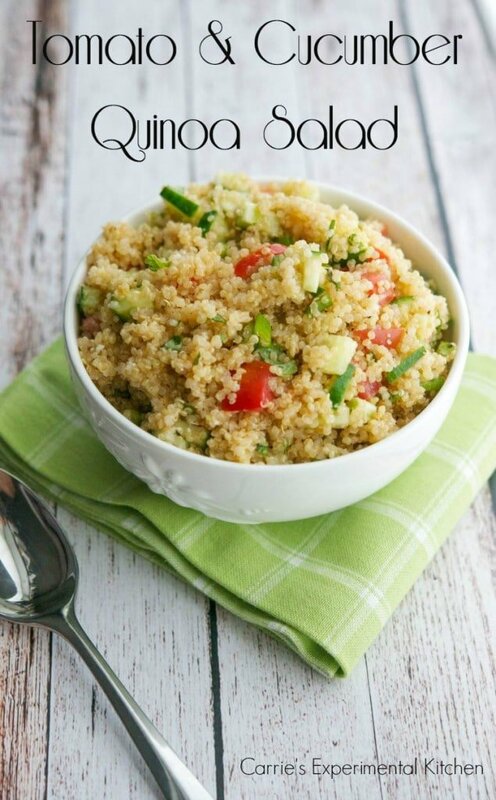 Once your quinoa is completely cooled, add chopped fresh garden tomatoes, cucumbers, scallions, basil and Pecorino Romano cheese. I used small diced plum tomatoes and English cucumbers and left the skin on; however, you can use a variety of other types of tomatoes or peel regular cucumbers instead. 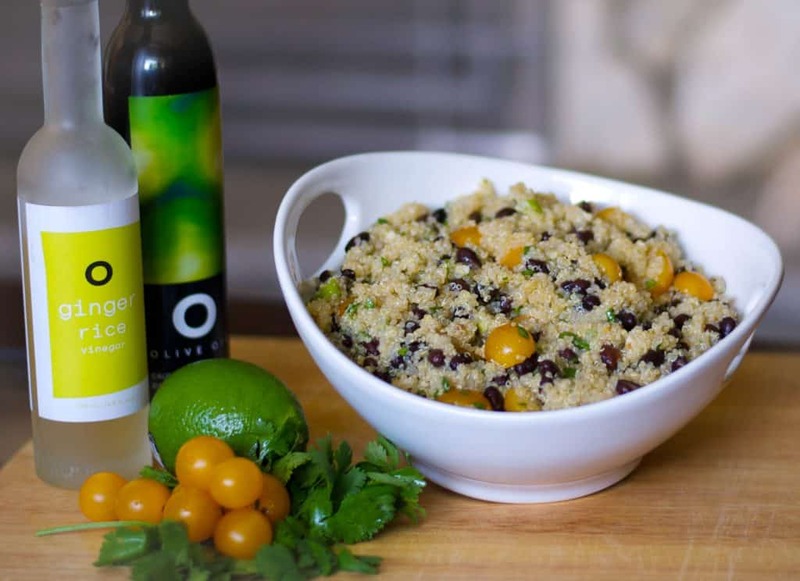 Next, I whisked together white balsamic vinegar, fresh lemon juice, and Canola oil (or any other light oil like Grapeseed; which won’t weigh down the salad); then poured it over the quinoa and mixed well. Not only was this Tomato & Cucumber Quinoa Salad deliciously light and refreshing, it also didn’t last very long. My family likes to eat this ‘as-is’ for lunch or I’ll serve it with grilled chicken or pork chops as a side dish. ~Enjoy! Prepare quinoa according to package directions and allow to cool completely. Can be made the day before and kept refrigerated. 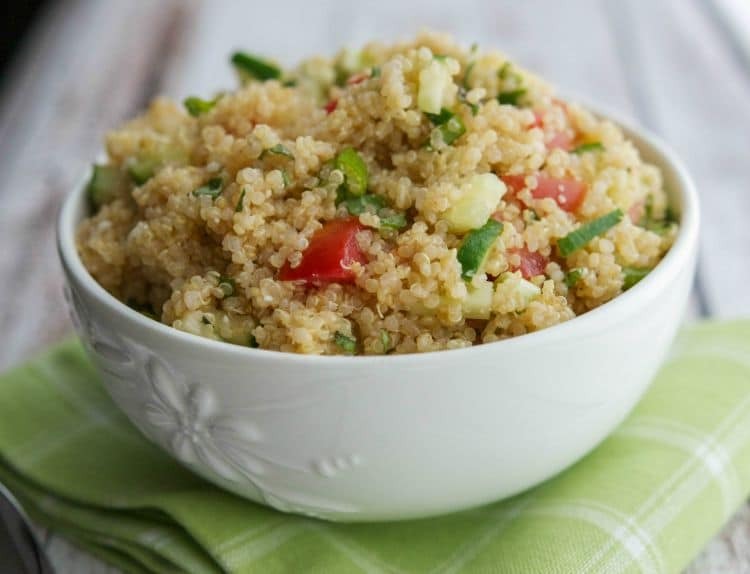 Combine the quinoa, tomatoes, cucumbers, scallions, basil and cheese in a medium bowl. In a small bowl, whisk the vinegar, lemon juice and oil; then pour over the quinoa. Mix well.